You will be met at the airport in Marseille, and transferred to the quaint and remarkable Aix-en-Provence. The town is known as the birth place of Post-Impressionist artist Paul Cézanne. Included is a three-night stay. This morning, depart from Aix-en-Provence and head to Arles where you will embark your Emerald Liberté Luxury ship. Tonight, enjoy a welcome reception and dinner on board. 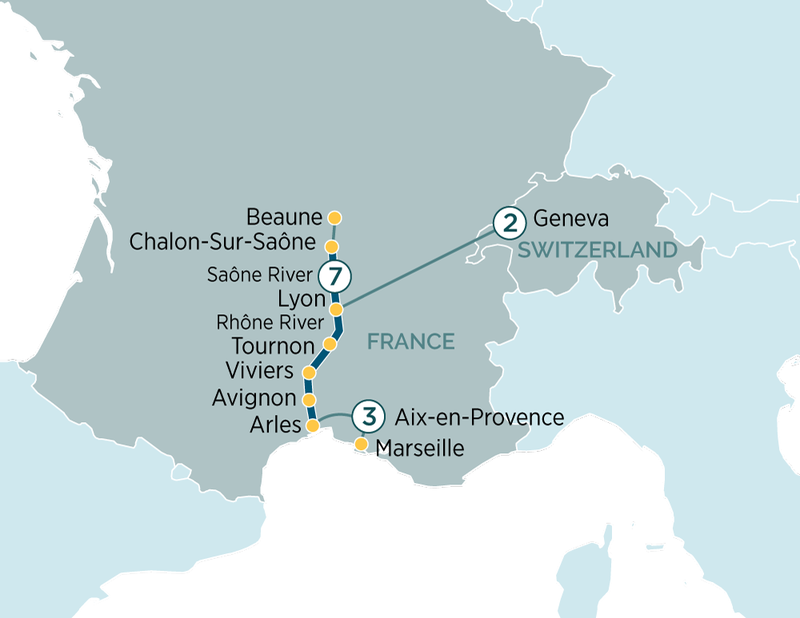 After breakfast disembark your river cruise ship in Lyon and transfer by coach to Geneva. This exuberant city is the headquarters of Europe’s United Nations and a global hub for diplomacy and baking. Included is a two-night stay in Geneva. Enjoy your sightseeing tour of Geneva, with some of the main highlights of your trip are the Jet d’Eau 140-meter high water jet, the quai du Mont-Blanc and rue de Rhone. The day is yours at leisure to continue exploring, this slick and cosmopolitan city nested in the Alps. Your tour director is at your disposal to help you plan your journey.